If you’ve never heard of The Honor Flight, it’s a wonderful on-going event for American military veterans. The genesis for the Honor Flight happened in December of 2004. It was on that date, that Earl Morse, a Retired Air Force Captain who is also a Physician Assistant at the V.A. clinic in Springfield, Ohio asked a WWII veteran if he would personally fly with him to the WWII Memorial in Washington D.C. The veteran was so grateful he broke down and cried and it was this charitable act that led to what has become known as The Honor Flight. You can read the entire history here. 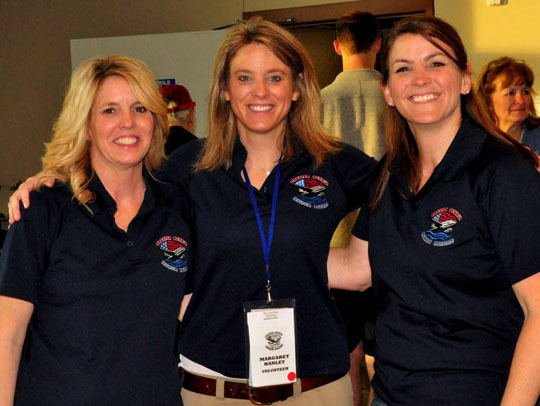 The Greater Peoria Honor Flight was started in 2013 by three sisters. They are pictured above and they are from left to right: Phyllis Piraino, Margaret Hanley and Mary Dunaway. I asked Phyllis a few questions about the Greater Peoria Honor Guard and she was kind enough to answer and those questions and answers are right below. How and when did this whole idea and program start? 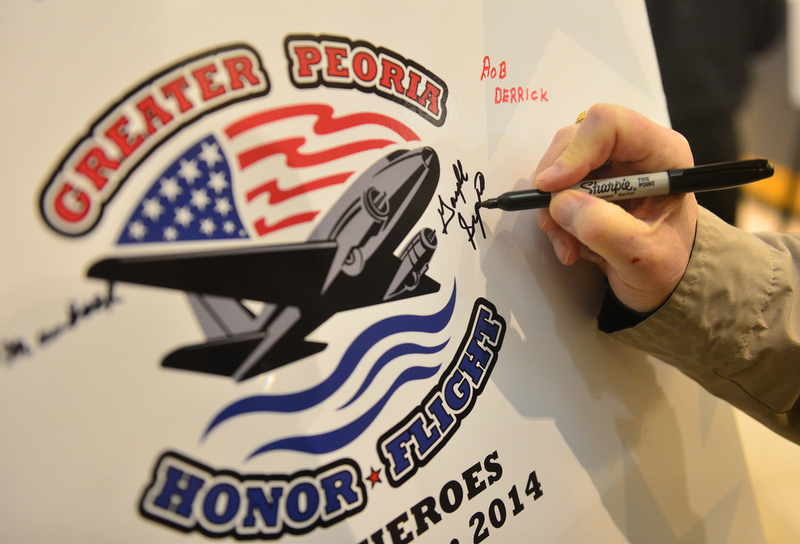 The Greater Peoria Honor Flight started a hub out of Peoria in 2013. We knew there was a need to have an Honor Flight that would go out of the Peoria Airport to make it easier on the Veterans in the Central Illinois area to travel to Washington D.C.
What was the date of the first flight? Our first flight was June 4, 2013. 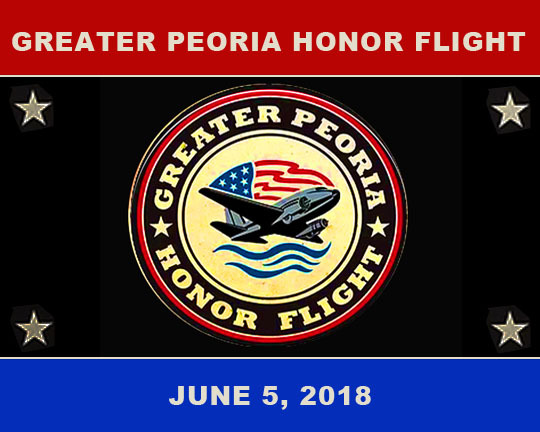 June 5, 2018 will be our 16th Honor Flight out of Peoria. How is the Honor Flight funded? Greater Peoria Honor Flight is funded by donations from individuals and businesses within the community. We also have several fundraisers, including our Pottstown Beef Fundraiser that raises over $20,000 each year. Our biggest fundraiser is Nets For Vets, that was started in 2013. It is done in grade schools throughout the Central Illinois area. Since 2013, school children have raised more than $300,000 to send our Veteran Heroes to D.C. You can donate by clicking here. How can people volunteer to help out with the Honor Flight? GPHF is run solely by volunteers. Volunteers can fill out an application by clicking right here. Any stories from past flights that are particularly memorable? One flight we were honored to have three former POW's on our flight from World War II. Another memorable flight was when we had a 101 year old, a 100 year old and a 99 year old. We have also taken several brothers and even a female WAC and a few Rosie the Riveters. How many flights go out through the year? We usually take 3 flights a year, but this year will be the first time we are taking four flights. We have flights scheduled this Fall on September 18 and October 16. How can a military veteran get on an Honor Flight? Any Veteran can fill out an application. You did not have to serve in a war/conflict. Applications can be found by clicking here. I’ve been wanting to do a blog on an Honor Flight for a while now, but kept putting it off because I never knew anyone connected with a flight before. 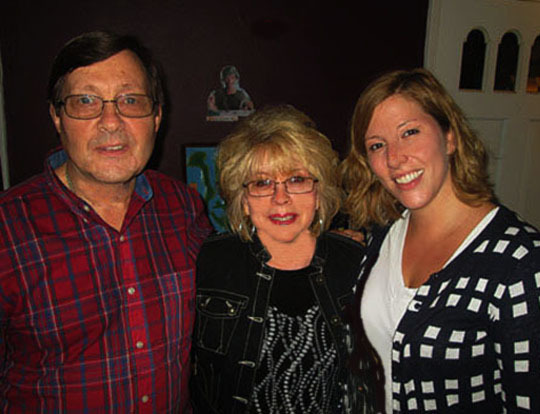 Well, my friend Amber, pictured above with her dad, Chuck and her mom, Diane, solved that dilemma for me. Amber’s dad, Chuck is a Vietnam veteran and Amber signed Chuck up for a Greater Peoria Honor Flight and today’s flight is the one that Chuck got chosen for. Every veteran goes with a guardian and Amber is Chuck’s guardian. And she’s also going to be taking pictures of this Honor Flight and I loaned her the MBIP Camera for this special day and night. Below are some of the photos that Amber took of this memorable day. There’s a dinner given in honor of the veterans who are part of the Honor Flight the night before they take off. It’s held at the Itoo Hall on Farmington Road and Amber went with her parents and took these photos from the dinner. The last photo is a picture of Diane’s father, Charles Eaves who was a World War II veteran. Chuck and Amber are taking this photo on their Honor Flight journey and will be leaving it at the World War II Memorial in Washington D.C. as a tribute to Diane's father's service in the military. The flight from Peoria to Washington D.C. Amber and Chuck said that the welcoming reception in Washington was amazing. Amber and Chuck said it was a full and memorable day and the proof of this is these photos that Amber took of their travels to the military memorials and sights of Washington D.C.
Chuck is a Vietnam war veteran and Amber took these shots at the Vietnam War Memorial. The last one is Chuck in front of the Vietnam Memorial Wall. Thank you for your service and bravery in that war, Chuck. This is a photo of an American Hero. Amber and Chuck left the photo of Charles Eaves at the World War II Memorial. As I mentioned at the beginning of the post, Charles Eaves was a World War II veteran and the father of Diane, Amber’s mom and Chuck’s wife. These are photos Amber took of the flight back to Peoria and some of the letters that were sent to Chuck in honor of this special day, thanking him for his service in the military. Thanks to everyone who sent a card or letter, it meant a lot to Chuck and he was overwhelmed by his personal stack of mail that he received. The last few shots are ones Amber took as they unboarded the plane and stepped back into the Peoria airport for the welcoming party. As you can see, there was quite a crowd to welcome the honored veterans back home to Peoria. The mood was festive and happy. Chuck and Amber’s welcoming party included Chuck’s wife, Diane, Amber’s husband, Joe, Joe’s mom Sue, Joe’s grandparents, Steve and Wilma, Diane’s cousins, Kathy and Sid and family friends Danielle and Brent. And me! As the honored veterans get off of the plane, they start a parade down the aisle where people can cheer and thank them for their service. There’s Amber and Chuck coming home after a long and historic day that I’m sure neither of them will ever forget! Chuck is welcomed home by his wife, Diane. Amber, Diane and Chuck posed for a photo and at the bottom is a photo that Chuck took with him of their daughter and Amber's sister, Amy. They're a beautiful family and congratulations to Chuck for being part of this Honor Flight and thank you for your service you gave for the country and for all of us. And thanks to Amber for taking photos of the experience and for making the whole event happen. The Honor Flight is a wonderful way to honor our veterans and if you can help out with a donation, it would be greatly appreciated. You can donate by clicking here. Chuck Asher and Diane Eaves, 1968, the night before Chuck shipped off to Vietnam. For most military veterans there’s a flip side to their story. Many veterans said goodbye to wives, girlfriends and boyfriends before going off to war and not knowing if it was the last goodbye that they’d share in person. One person goes to war and another stays home and worries and wonders if they’re ever going to see their significant other again. Diane Eaves started worrying in the spring of 1968 when Chuck went off to Vietnam. Last night Diane shared what it was like to be the other half of a military veteran’s story and here’s some of her thoughts that she remembered from those times. From that moment on we were engaged to be married. Shortly after we got engaged he told me he had gotten drafted and would probably be going off to Vietnam. I remember going out to dinner before he had to go and we couldn’t even eat what we had ordered. It was rough and a very bad evening. He left early in the morning and was in Vietnam for over a year. I stayed with my parents and worried all the time about the situation. I wrote him letters every day and would send him boxes of candy, cookies and cakes. We each had a cassette player and we would send tapes back and forth to each other. I missed him so much and would tell him so on the tapes and would let him know what I was doing. I think in that whole time we only got to talk on the phone twice. One time we could hardly hear each other and there was a man on the line telling Chuck what I was saying. It was so strange and bizarre. I remember him yelling to Chuck on the phone and screaming, “She says she loves you!” What crazy times those were! After what seemed like an eternity he finally came back in the spring of 1970. We kind of had to get to know each other again and like most Vietnam veterans he went through some tough times. We got married in August of 1970 and I’m so happy that Chuck got back home. And I’m anxious for him and Amber to come back tonight to hear about this special day. Chuck and Diane Asher, June 5, 2018.